Mariners Latest: Justin Smoak Sent To AAA Tacoma! Justin Smoak Sent To AAA Tacoma! 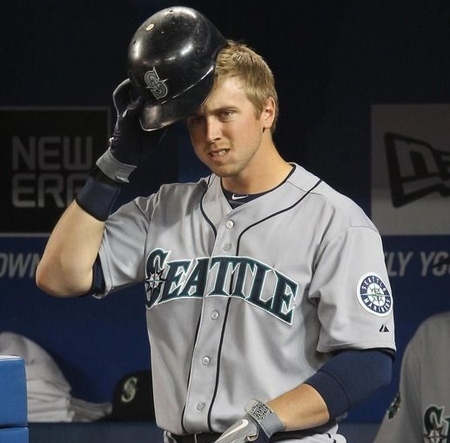 As if it wasn't enough to have Ichiro Suzuki leave the Mariners for the New York Yankees on Monday, following the Yankees 4 - 1 defeat of the Seattle Mariners, it was announced that Justin Smoak would be demoted to class AAA Tacoma effective immediately. Smoak has struggled consistently at the plate since becoming the American League's Player of the Week at the end of May/beginning of June. In the last 10 games Smoak has hit just .077 and has gone 0 for his last 16 at the plate, dropping his average to a low .189 on the year. In Eric Wedge's comments in the post game interview he stated that he and Jack Z sat down with Smoak and discussed how this move was for his good. Who knows how that translates to a guy that has struggled so much and has now been told that he lost his job, but it cannot be easy. The move comes at an opportune time however, as Mike Carp just used up his last rehab start with Tacoma and is out of options. He either remains on the DL or is a part of the 25 man roster. Carp has not been hitting well at all since being in Tacoma. He went on the DL at the beginning of the year after landing on his shoulder wrong while diving for a ball in Japan against the Athletics, but after returning to the lineup and continuing to struggle, Carp admitted that his shoulder was still bothering him and was put back on the DL. During his rehab stint he has only hit .218 between Class A (2 games) and Class AAA Tacoma. Carp will look to take over the duties at first base while Smoak continues to find himself and works out his struggles. That leaves a wide open spot in right field that we can look to see Casper Wells filling for the remainder of the year. Our new left fielder will be Carlos Peguero. That is, at least until Franklin Gutierrez gets back. In the meantime, it sure would be nice to see some fresh blood up at the Major League level. Let's see something new. There is still a flurry of activity on the horizon as Jason Vargas' future with the Mariners still lies in the balance. He has pitched very well in his last couple outings and is expected to be dealt before the July 31st trade deadline. With Ichiro out, Vargas on his way and Smoak down to Tacoma, there is a lot to be considered about where we are as a team. By the sound of it, we very well may have no idea what we are doing. Building toward the future seems to be working it's way toward shedding for a sale of the team. I wouldn't be surprised now that Ichiro is gone, but even in a perfect world where that did happen, we're still a long way off from anything close to a playoff caliber team being in Seattle. Let's hope that this new dynamic without Ichiro has a ripple effect on this team and people start taking a hold of the spotlight that needs a new place to shine in Seattle. Applications are being accepted.